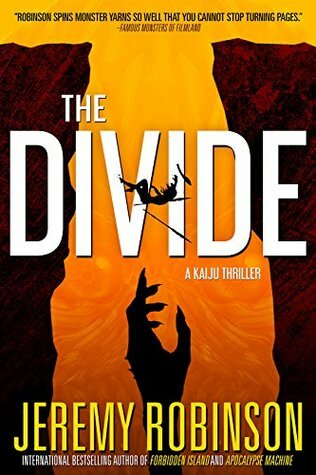 by Jeremy Robinson (2018) No one remembers how the Divide was created. The miles-deep and miles-wide chasm has existed for hundreds of years, protecting what remains of humanity from the Golyat: a creature whose shadow moves across the horizon at sunset. Davina, daughter of Jesse, is a shepherd. She spends her days guiding herds of deer through the forests of New Inglan, protecting them from predators, herding them away from the Divide, and ensuring the tribe of Essex has meat when needed. While many shepherds die in their first year–from the elements, from injury, or in the jaws of a wolf–Davina is resilient. Having just slain a mountain lion, Davina returns to her village to discover a hunting party has been sent out in search of the Modernists, a group fascinated with the past, the technology that once filled the world, and what lies beyond the Divide. To keep the Modernists from reaching the Divide’s far side, and revealing humanity’s presence to the Golyat, the hunters will torture and kill them all.